Suspected Boko Haram operatives have five soldiers, three vigilante members and a civilian JTF member in an ambush in Borno State. 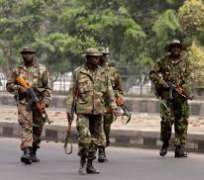 The Nigerian Army said in a statement on Sunday that nineteen soldiers and a civilian JTF member sustained injuries during the attack. According to the statement by the Acting Army Spokesman,Colonel Sani Usman, “Operation Lafiya Dole troops carrying out clearance operations on suspected Boko Haram terrorists hideouts in Talala and Ajigin, southern part of Borno State, were ambushed by suspected Boko Haram terrorists at Ugundiri village, Damboa Local Government Area, Borno State, while returning to base after clearance operations yesterday. “Unfortunately, 5 soldiers, 3 vigilantes and 1 Civilian JTF lost their lives during the ambush, while 19 soldiers and 1 Civilian JTF sustained various degrees of injuries. “The bodies of the late soldiers and civilians have been evacuated to Maiduguri while the injured are receiving commensurate medical care and are in stable condition. “The troops destroyed the terrorists Gun truck and recovered 2 Anti-Aircraft guns, 2 spare Gun barrels, 1 General Purpose Machine Gun, 1 Rocket Propelled Grenade, 1 AK-47 Rifle and 320 rounds of 7.62mm ammunition. The Army stated also “that another set of troops had earlier cleared Zira, Abulam, Dusula, and Buk villages before returning to base in Bulabulin. “In a related development, based on information received about gathering of some suspected Boko Haram terrorists around Bori village, which is 16 kilometres away from Mainok, outskirts of Maiduguri, troops swung into action and neutralized them. The troops recovered 3 Motorcycles, 1 hand Grenade, 1 round of 7.62mm ammunition, Solar panel, a pair of Niger Republic military camouflage uniform, 1 Gionee mobile telephone handset, 1 Wet Cell battery and half bag of groundnut,”Usman said.